Leading Russian and Moscow rabbis last week dedicated a new mikveh in the Russian capital’s oldest existing Jewish community. Leading Russian and Moscow rabbis last week dedicated a new mikveh – a ritual immersion pool – in the Russian capital’s oldest existing Jewish community. The modest but impressive ceremony took pace at the Darchei Shalom synagogue in the Otrendoe neighborhood, following a contribution by a leading Jewish lay leader. Russia’s Chief Rabbi Berl Lazar and Darchei Shalom’s Moscow-born Rabbi David Karpov, both of Chabad, spoke at the dedication. The mikveh is an addition to the synagogue and is in addition to several mikvehs that have been built in the city the past several years for Jewish families, and Torah lessons on family purity have become increasingly popular. He studied for a Bachelor of Arts degree in religious studies at the Rabbinical College of America and was ordained at the Central Lubavitch Yeshiva in New York at the age of 23. His wife Chana Deren is a U.S. citizen. 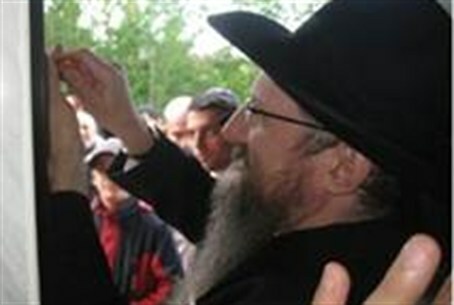 In 1997, he helped establish the Federation of Jewish Communities of the CIS representing Chabad communities in 15 countries of the former Soviet Union.